Join Us!!! We are looking for someone to help us cover Chinese basketball. Please send us an e-mail. 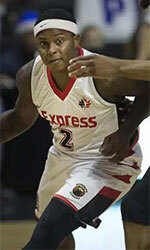 China: Luoyang adds Rayson to their roster, ex Sudbury F.
Guangdong outgunned Shenzhen to take 3-0 lead in the series. Guandong Tigers dominated down low during the game scoring 80 of its points in the paint compared to Leopards' 54. They looked well-organized offensively handing out 21 assists. It was a great evening for the former international Jianlian Yi (212-87) who led his team to a victory with a double-double by scoring 33 points (!!! ), 14 rebounds and 4 blocks. American swingman MarShon Brooks (196-89, college: Providence) helped adding 15 points, 14 rebounds and 7 assists. The best for the losing side was American point guard Dwight Buycks (191-89, college: Marquette) with 21 points and 7 rebounds and international guard Dehao Yu (188-95) scored 20 points and 6 rebounds. Four Guandong Tigers and five Leopards players scored in double figures. Both coaches used bench players in such tough game. Liaoning upset Xinjiang to stop the rot as they cut the deficit at 1-2 in the semis. Flying Leopards made 21-of-22 charity shots (95.5 percent) during the game. Xinjiang Flying Tige was plagued by 25 personal fouls down the stretch. It was an exceptional evening for American Lester Hudson (190-84, college: UT Martin) who led the winners and scored 32 points, 9 rebounds and 4 assists. The former international Ailun Guo (192-93) accounted for 34 points (!!!) and 4 steals for the winning side. American forward Jarnell Stokes (201-94, college: Tennessee) came up with a double-double by scoring 22 points, 10 rebounds and 5 assists (on 9-of-11 shooting from the field) and the other American import point guard Kay Felder (175-95, college: Oakland) added 17 points, 5 rebounds and 5 assists respectively for Xinjiang Flying Tige in the defeat. Five Xinjiang Flying Tige players scored in double figures. Xinjiang Flying Tige's coach rotated ten players in this game, but that didn't help. Xinjiang punched their ticket to the CBA finals, in a rematch of the 2016-17 Finals in which they swept Guangdong 4-0 to claim the clubs first CBA Championship. Xinjiang completed their dominance of Liaoning in the semi-finals 4-1, while Guangdong has remained relatively untested, sweeping crosstown rivals Shenzen 4-0. This should be a matchup of two of the best Chinese players in the league, in perennial CBA MVP and former NBA lottery pick Yi Jianlian, and up and coming global star from Xinjiang, Abudushalamu Abudurexit, this seasons most improved player. The imports will take center stage, when Marshon Brooks and Michael Beasley set to battle Kay Felder and Jarnell Stokes. CBA game 1 is in Dongguan City, 04-26-2019. Guangdong stormed past Shenzhen to sweep the semifinal series. Guandong Tigers dominated down low during the game scoring 86 of its points in the paint compared to Leopards' 62. They outrebounded Leopards 57-25 including a 22-5 advantage in offensive rebounds. The winners were led by the former international Jianlian Yi (212-87) who had that evening a double-double by scoring 37 points (!!!) and 17 rebounds (on 16-of-21 shooting from the field) and American swingman MarShon Brooks (196-89, college: Providence) supported him with 23 points, 9 rebounds and 5 assists. Even 28 points and 5 rebounds by American point guard Kenny Boynton (188-91, college: Florida, agency: Higher Vision Sports) did not help to save the game for Leopards. 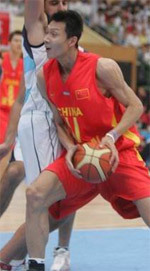 International center Zijie Shen (205-97) added 19 points and 7 rebounds for lost side. Five Guandong Tigers and four Leopards players scored in double figures. Both coaches used bench players which allowed the starters a little rest for the next games. Xinjiang fired past Liaoning to take 3-1 advantage. Xinjiang Flying Tige dominated down low during the game scoring 66 of its points in the paint compared to Flying Leopards' 44 and made 20-of-25 free shots (80.0 percent) during the game. They outrebounded Flying Leopards 47-34 including 35 on the defensive glass. Worth to mention a great performance of American forward Jarnell Stokes (201-94, college: Tennessee) who helped to win the game recording a double-double by scoring 31 points and 12 rebounds (on 12-of-15 shooting from the field) and international Abudushalamu Abudurexiti (203-96) who added 24 points and 11 rebounds (made all of his ten free throws !!!) during the contest. Four Xinjiang Flying Tige players scored in double figures. At the losing side American Lester Hudson (190-84, college: UT Martin) responded with 21 points and 6 rebounds and his fellow American import forward Brandon Bass (203-85, college: LSU) scored 18 points and 6 rebounds. The winner was already known earlier in the game, so both coaches allowed to play the bench players saving starting five for next games.